Body Weight: 40-86 kg (88-190 lb); females often weigh more than males. Pelage: Short, light brown, beige, sandy, or ginger hair; spotted with black or brown on the neck, shoulders, back, flanks, rump, legs, and tail base. Range: Sub-Saharan Africa, though historically across Africa and Eurasia. Habitat: Generalist; semi-desert, savanna and open woodland, dense, dry woodland, and montane regions. Sea level to 4,100 m (13,450 ft). Activity Cycle: Nocturnal, though not uncommonly active in daylight. Often rest for long periods of time. Social Groups: Highly social, living in clans of one to several matrilineal lines and immigrant males. These stable units are composed of 8-80 individuals. Clan members often range widely. Cooperatively defend territory, food resources, and the communal den site. Dominance hierarchies govern interactions. Females dominate males, receiving preferential access to food. including hair and bones. Scavenge at times. Predators: Commonly killed by lions, other spotted hyena, and humans. Sexual Maturity: 2-3 yrs. Males first reproduce c. 3-4 yrs, females 2-5 yrs. Gestation: 98-111 days, 110 commonly reported. Litter Size: 1-2 typically, triplets rare. Birth Weight: c. 1.5 kg (3.3 lb). Age at Weaning: c. 1 year. Longevity: In captivity, to 40 yrs; mean c. 20 yrs. zebra, buffalo, or giraffe. They hunt a wide variety of prey and will scavenge at times. Specialized teeth and digestion enable the consumption of nearly all portions of their prey: meat, bones, and hair. Clan members cooperatively defend territory, food resources, and the communal den site. All members adhere to a strict social hierarchy in which females are dominant to males. Females typically remain in their natal clan for life, while males emigrate shortly before reaching sexual maturity. © 2014-2019 San Diego Zoo Global. Population estimates and IUCN Status updated Apr 2019. How to cite: Spotted Hyena (Crocuta crocuta) Fact Sheet. c2014-2019. San Diego (CA): San Diego Zoo Global; [accessed YYYY Mon DD]. 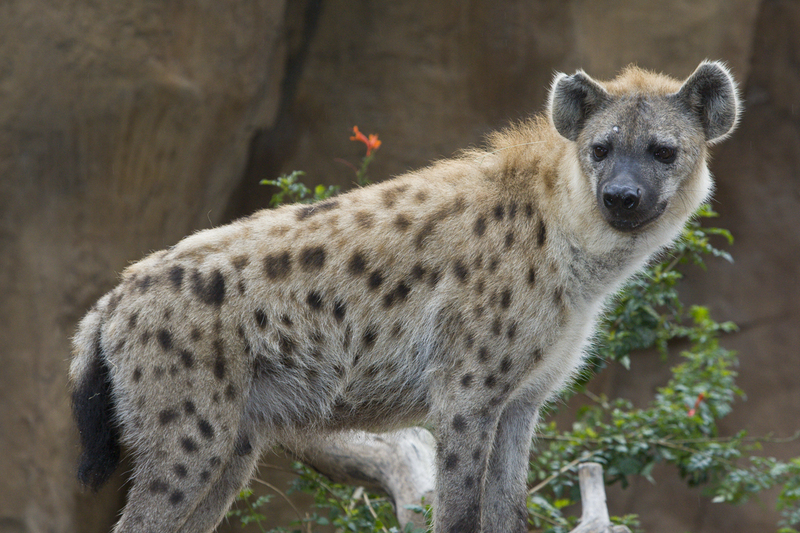 http://ielc.libguides.com/sdzg/factsheets/ spottedhyena.